This unit fought principally on the northern-most front of the war: in northern Norway and Finland, where its task was mainly to support bombers attacking the Allied convoys en route for Russian harbours. They also protected the German battleships and U-boats plying Norwegian waters. Numerous « free-chases » and ground attack missions were flown daily over Soviet territory. Oblt. Horst Berger (left), leader of the 8. Staffel JG 5 was posted missing on 8th May 1944 during a combat over the Barents Sea in his « Black 11 ». Here follows the list of MIA pilots of JG 5. Any question concerning this list is welcomed. If you have the answer to just one of these entries, I would be glad to include your remark and name. This plane made a forced landing at Räetkävaara, northerneast Finland. Even today it is over twenty kilometres to the nearest road from this site. 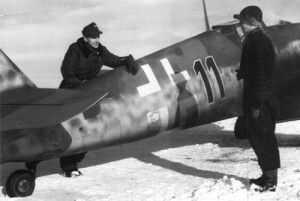 In order to become POW Seibt should have had walked at least 150km, cross a few roads and go under a few phonelines along his way.All this in deep snow and to begin with he was already completely out of his bearings when he made that forced landing. I rather believe that his remains are yet to be found at the Kaldoaivi wilderness. Became POW, aircraft found in 1993. (Thanks to Rune Rautio and Milan Krajci). Both KIA, but no grave is known to the officials. Still MIA but probably KIA: JG 5 searched the sea off the Fischerhalbinsel for 13 hours after the crash. They could not locate any trace of him, and later assumed the crash had been ashore. Crashed at Maaninkavaara, Finland.The pilot apparently had gotten lost and when running out of fuel decided to bail out. He ended up landing in a tree and for some reason couldnt free himself but died there. The body was found only after the war. Was later buried, probably German soldiers cemetary at Norvajärvi near Rovaniemi. Following Milan Krajci, Harder was MIA in the Wladimir area. Thanks for this precision. Binna 1./JG 5 Bf 109 G-6 (165839)white 7 Near Avranches. KIA. Buried at Mont-de-Huisnes (France). Gruft 54 Grabkammer 70.